By now, it’s pretty commonly suspected — and not just by bitter pitchers, either — that MLB’s recent home run surge can be traced back to a supply of zippier-than-usual baseballs. The research of our colleague Rob Arthur and The Ringer’s Ben Lindbergh backs up that theory, regardless of what Commissioner Rob Manfred has to say on the matter. And with apologies to those poor, beleaguered pitchers, we say: Good! Who doesn’t enjoy the old-fashioned fun of watching baseballs be launched into the atmosphere? (Judging from the ratings for last week’s Home Run Derby,1 nobody — that’s who.) As a celebration of the long ball, then, we used data from ESPN’s Home Run Tracker to plot out just how far MLB’s hitters have bashed the ball over the years. Anyone who watched Aaron Judge’s performance at the Derby could be excused for thinking that baseballs can, in fact, exit the solar system. 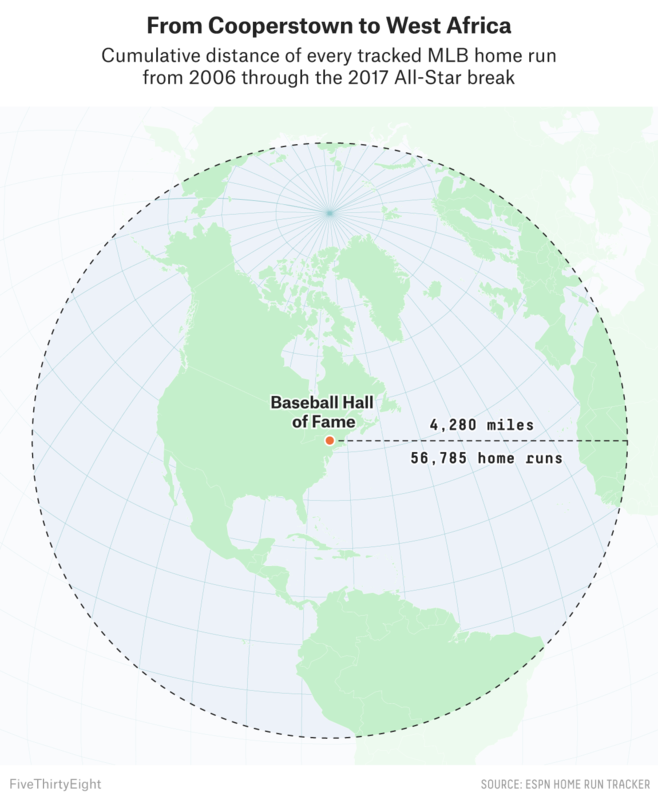 The true distances that home runs travel are less than interstellar, of course — though still impressive. According to the Home Run Tracker, which has data going back to 2006, major league batters have crushed 56,785 tracked homers over the last 11.5 seasons, adding up to a grand total of 22,599,628 feet — or 4,280 miles. To put that number in perspective, let’s do a little geography experiment. 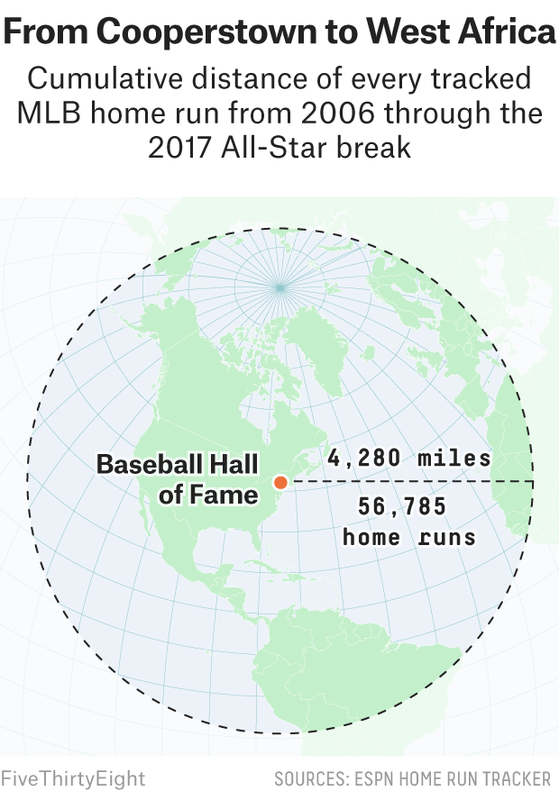 If we started in Cooperstown, New York, home of the Baseball Hall of Fame, and laid the distances of every home run in that span end to end heading east across the Atlantic Ocean as the crow flies, we would reach the border of Mali and Mauritania in northwestern Africa. Head south and the homers reach the northern corner of Chile, near its borders with Peru and Bolivia. Head north, the homers easily clear the pole, with the last one landing somewhere near Russia’s Bolshevik Island. Because of the home run surge, that circle is growing more rapidly than ever. Already this season, hitters have driven the ball 1,337,266 feet, or 253.3 miles. That’s 69 percent of the yearly average distance between 2006 and 2016, and as of the All-Star break, we were only 55 percent of the way through the schedule. At that pace, this season will eventually see 466 miles of home runs be hit; that would easily be the most in any season since 2006, and it would be a 10 percent increase over the previous high of 425 miles, set in 2016. Among players whose entire body of homering work falls within the Home Run Tracker era, the biggest bopper is Seattle Mariners designated hitter Nelson Cruz. Cruz has mashed 297 tracked home runs over a cumulative distance of 121,805 feet, or a hair over 23 miles. String those together, and that’s enough to travel from Safeco Field in downtown Seattle south to Tacoma. Across the country, Mike Trout has been busy trying to make his team’s “Los Angeles Angels of Anaheim” moniker legit with his home runs. With a little over 14 miles’ worth of bombs to his name, Trout has already homered enough distance along Interstate 5 to land in Los Angeles County — and about halfway to downtown L.A. Only a guy who might end up being baseball’s greatest player could reconcile the most absurd team name in sports back to some semblance of reality. Speaking of New York City, we don’t have a Judge map yet because he’s only hit 34 career home runs (for 2.7 miles — basically the distance from Yankee Stadium to Central Park). We’ll have to wait and see just how far he can mash the ball in the years to come. Cruz, Stanton and company still have many more miles to go before catching up to that lofty total. But the way today’s hitter-friendly baseballs have been flying out of parks, maybe we’ll see somebody get to 60 miles of home runs before too long. Which aired on ESPN — the company that owns FiveThirtyEight.